Well. That was a busy weekend. If you follow me on Instagram, you know what part of my weekend was spent doing. I'm tired and I'm happy to have a new week begin. Maybe I can relax a little. 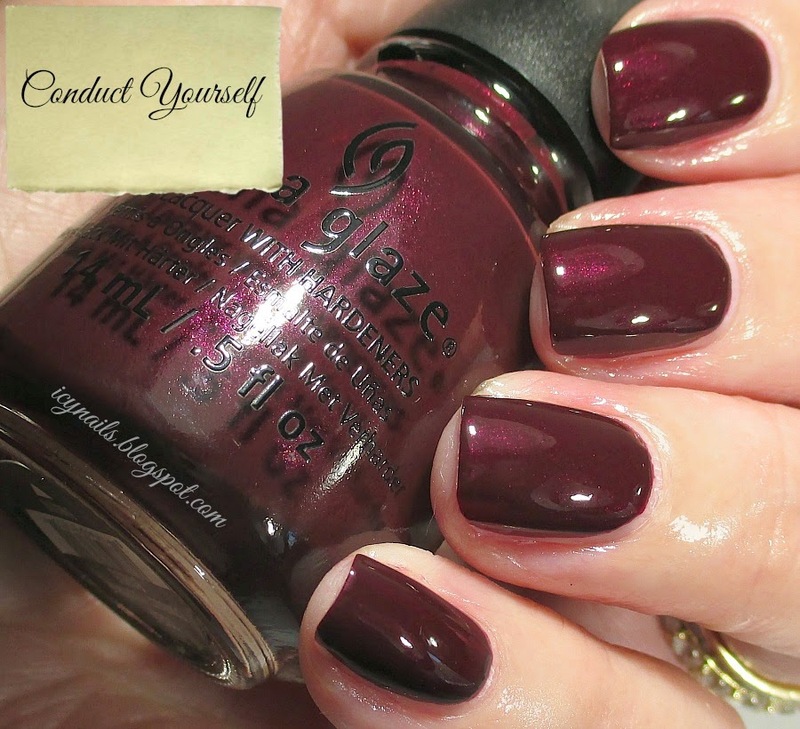 Today I have some China Glaze fun for you. I told myself no more buying entire collections unless they are quite exceptional. well, guess what? Yeah. I decided to do something different, for me. I usually only post one or two polishes at a time or I hit you full on with the whole bunch, at once. This time I broke this review in half. The shimmers and the cremes and glitter. 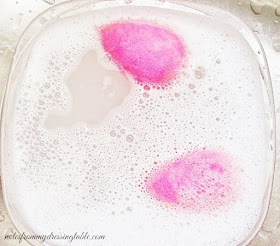 Today, I am sharing with you the shimmers. All polishes are swatched over China Glaze Strong Adhesion Base Coat and topped with Seche Vite Dry Fast Top Coat. Let's get this journey started, shall we? First of all, Lug Your Designer Baggage because I'm not carrying it for you! Rich slightly greyed down brown crelly packed with gold flakies give your nails a luxe finish in just two easy coats. Hey, where are you going? Bar car? I'd like a martini, please. Vodka. Up. Big. Very dry, three olives. Oh and when you change cars remember to Mind the Gap! And don't spill my drink... Mmmkay? This delicate semi sheer chartreuse shimmer is infused with gold and blue shimmer. Jelly like base with a lot of shimmer dust, this polish is a bit persnickety to handle. It doesn't like to be over worked; if you even think about it, it will drag a bald spot. Don't believe me? Look at my ring nail! Otherwise it didn't give me much trouble. Just be deft with it. This is three coats. Why so blue Darling? Don't you know that always, always, I Choo-Choo-Choose You? This is the polish in this collection that everyone is so ga-ga over and I can see why. Gentle reader, this polish is gorgeous. This dusty purple crelly with a shimmering green to gold duochrome shift is just the kind of thing I like to wear on my nails. This swatch is three easy, smooth coats. 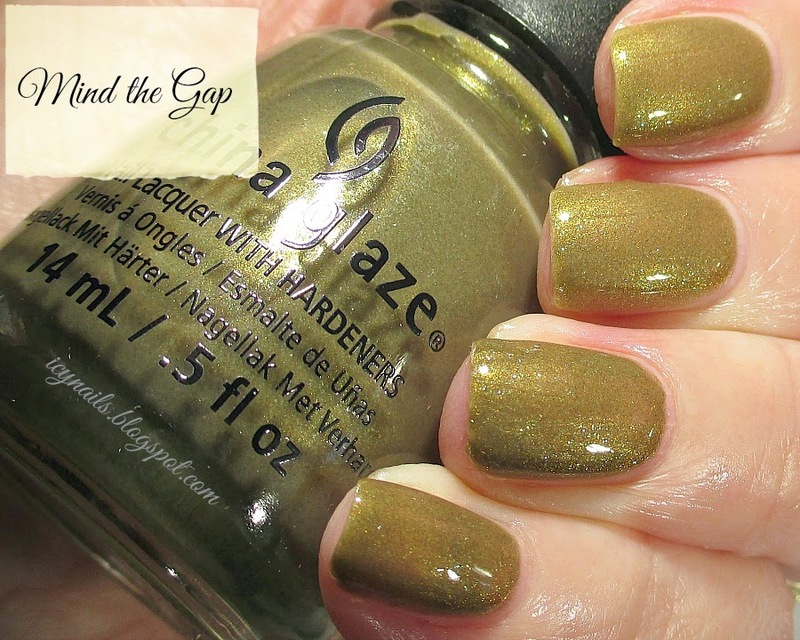 This polish is a hot ticket! I suggest that if you like what you see, you get one, toot-toot-suite! Hey you! Yes, you! Nice Caboose. Even nicer than the nicest caboose is this juicy deep raspberry pink jelly glowing with fuchsia shimmer and silver flakies. Well... There were supposed to be flakies. They were all at the bottom of the bottle and precious few landed on my nails. I think that had the flakies done their job, this polish would have been elevated from pretty to pretty spectacular. The formula is great, tho. Two easy-peasy coats did the trick. Conduct Yourself . I was just having a little fun! Railroad officials, these days... Take their jobs so seriously. 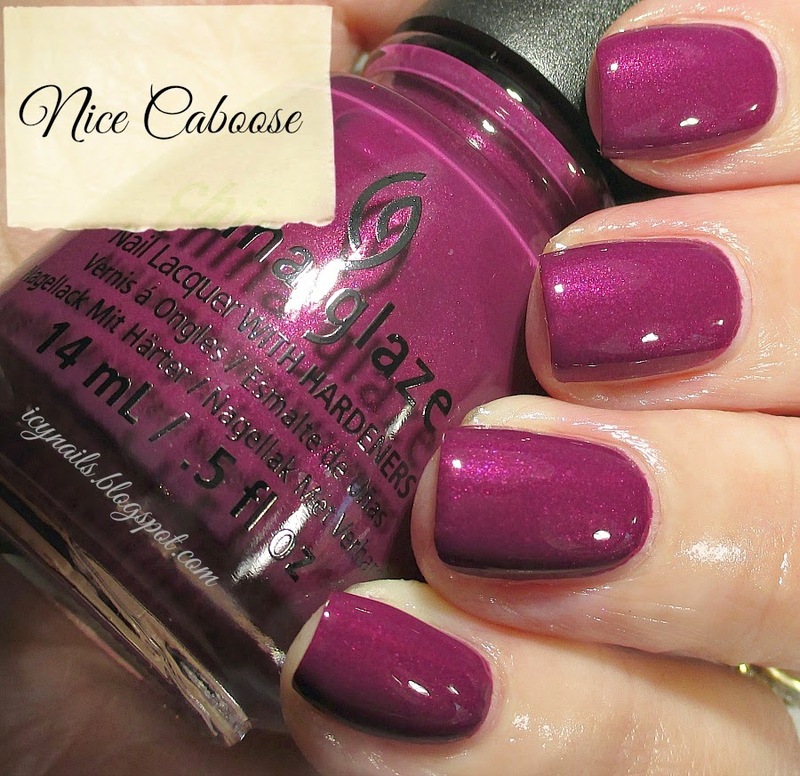 How do you like chocolate plummy goodness with a hidden pink shimmer that fires in bright light? 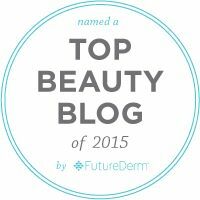 This rich, delicious creme is flawless in two dreamy coats. Uh-oh! Someone was running late. There's a man running alongside yelling to the conductor to Stop That Train! 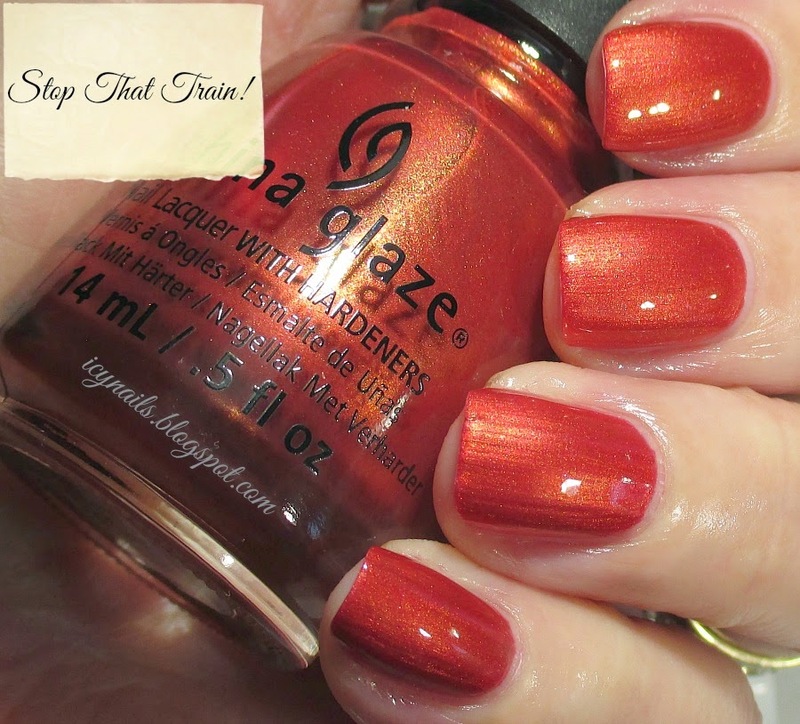 A bright orange-red metallic with gold shimmer that in my own opinion doesn't quite go with this collection. It is definitely the outlier of the bunch. Beautiful but... A strangeling. This polish was perfect in two easy coats. If your nails are ridgey, save yourself some grief, use a good ridge filler. So, there we go. 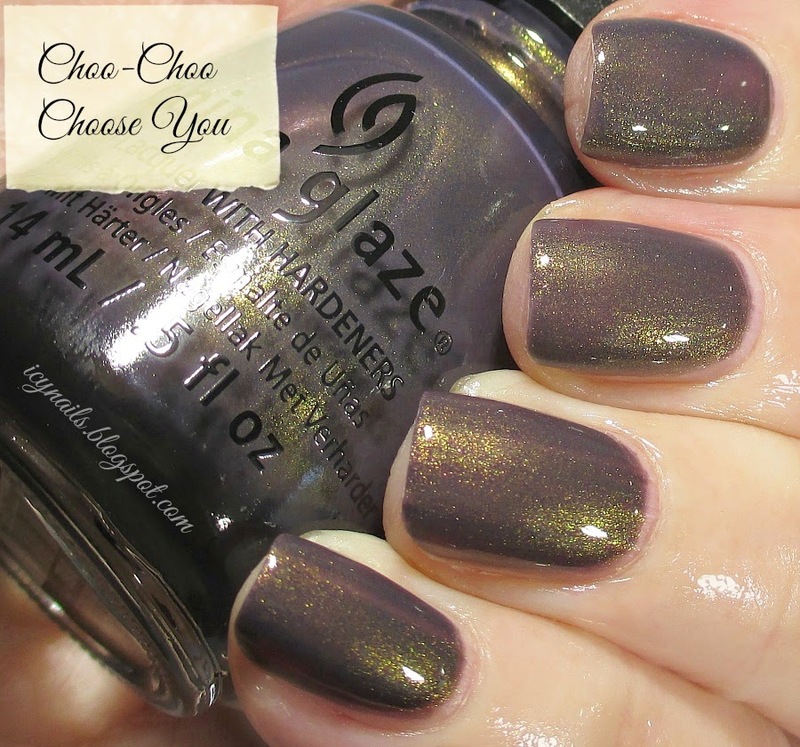 The shimmery half of the China Glaze All Aboard Collection for Fall, 2014. See anything you like? Anything you already own? If you are in to them, they are available at Ulta, online and in store, from Amazon (that is where I got mine), Sally Beauty Supply and various other beauty supplies and retailers that carry China Glaze. Stay tuned for the cremes and glitter. And until we meet again, travel safe! Some really pretty colors in this collection. I like Nice Caboose- funny name though. Nice Caboose is calling me! I picked up a couple of these, but I really need the rest. This is a gorgeous collex! choo Choo is one of my faves of all time! Design baggage and Conduct Yourself are so stunning. Your swatches are fabulous - I really want I Choo Choo Choose You! I will not buy any more makeup (or nail polish in your case)...... said no woman ever. Yay to women who cried wolf in the name of beauty, lol! 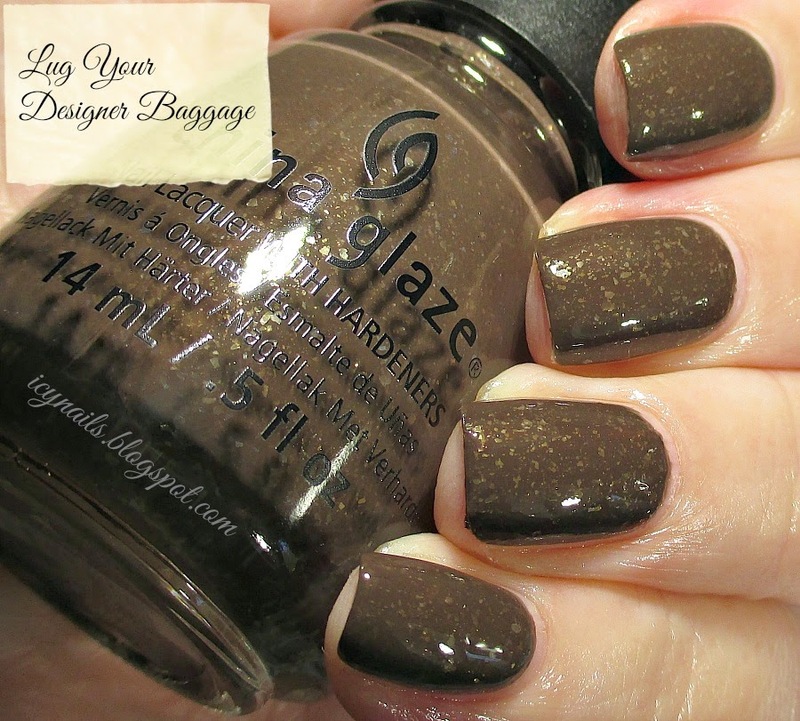 China Glaze is one of my favorite nail polish brands... I need this collection! Choo Choo Choose You, Nice Caboose, and Conduct Yourself shall be MINE! Stop That Train! would be my pick of these! I'm just not into Choo Choo Choose You. so pretty! Choo Choo Choose you is awesome. Stop That Train is amazing! You should see it in person. It's so gorgeous! Yes. Yes, they are. I am goofy for Fall polishes. It is, isn't it? It's so bright and warm. Hee! Hee! And yes, it's gorgeous, isn't it? It seems to be the darling of this collection! Yes, it is! I am loving it! 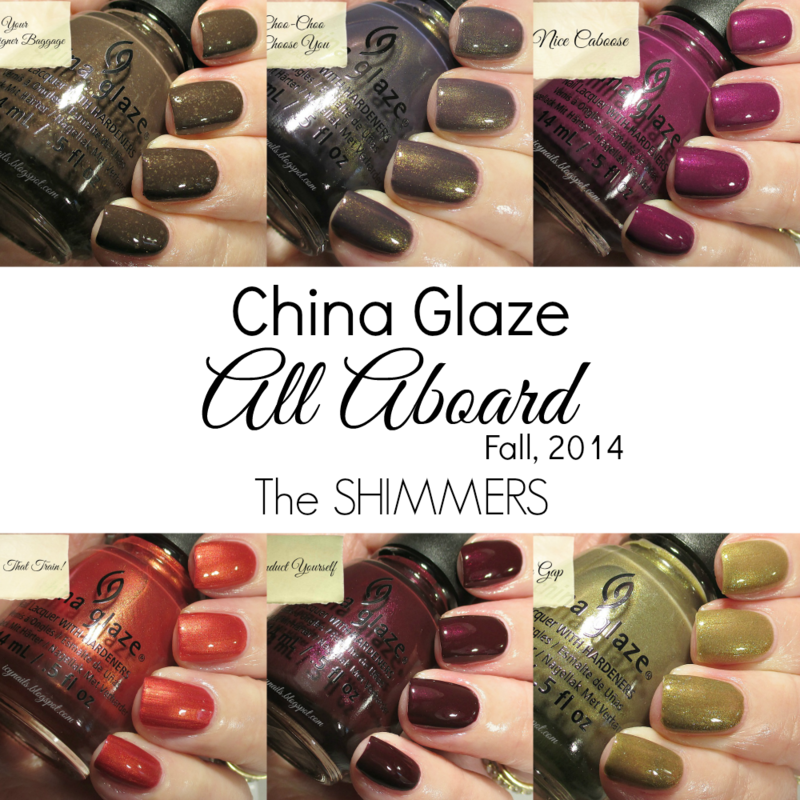 I adore Fall polish collections. Everyone loves that one. I love it! China Glaze is my spirit animal polish. :D I hope you got these beauties. Thank you so much! That one is the belle of the ball. Everyone wants it. Aren't they rich and gorgeous? Right? I love that shimmer/shift. Amazing! I hope that you got them! This is a collection worth curating in it's entirety! Thank you! Isn't it wonderful? Rawr! Good choice! It's so rich and beautiful and flattering. Get it! It's going to look fab on you. It is a funny name, isn't it? The polish sure is a beauty!